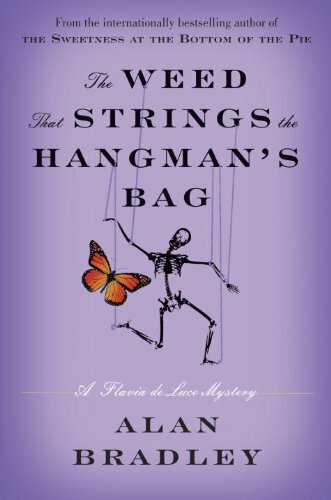 This would be the second of a projected five "Flavia de Luce" mysteries, and is every bit as oddly charming as the first one. Flavia remains passionately interested in chemistry, especially poisons, unhealthily interested in death, ridiculously embattled with her sisters, and as eccentric as ever. This time, however, the mystery doesn't really kick in until a third of the way through the book. To get us there, however, we meet two strangers in the village, Rupert Porson of "Porson's Puppets" and his lovely assistant Nialla. The Porson's Puppets van has broken down fatally, and there is no way to pay for repairs without holding two puppet shows at the church hall. Flavia happened to be playing corpse in the graveyard when the van arrived, and was quickly dragged into service to make the shows happen. Rupert Porson is a minor celebrity, and his "Snoddy the Squirrel" is apparently a very popular children's program on BBC--which Flavia didn't know, since there is no television at Buckshaw. Thus there is a built in audience for a show, and Flavia quickly becomes the gofer for Rupert and Nialla. She is also as nosy as before, and after conducting some chemical experiments (delightfully described to the point they would conceivably be replicable), she figures out that Nialla is pregnant, Rupert is a batterer, Gordon Inglesby grows marijuana, and that many of these people have known each other from before. The vicar casts about the neighborhood for a place for Rupert and Nialla to camp, and the invitation comes from the Inglesbys--Gordon and Grace--who lost their five year old son some six years before. As a result, Grace has become nearly mad with grief, and the farm is mostly run down. Also residing on the farm is a former prisoner of war, Dieter Schratz, and a Land Farm Girl named Sally Straw. The matinee performance goes well, but at the evening performance there is a problem. As puppet Jack (who looks exactly like the Inglesby's dead son) chops down the bean stalk, there is a rumble and a crash. But it is not the puppet giant who lands on the small stage--it is Rupert Porson, apparently electrocuted and dead. As Flavia pedals her bicycle (named Gladys) around the town, she learns that Robin Inglesby's death was not usual. In fact, his body was found hanging from the remains of the old gibbet left rotting in the woods outside the village. He had been playing with a rope all that day, and apparently died accidentally while recreating a scene from a Punch and Judy show. Or did he? The suspects mount up: there is Nialla, Rupert's current paramour; Mutt, the BBC producer who comes down to round up Rupert to face some unspecified mess he's left behind; the vicar and/or his wife; the ex-German Luftwaffe pilot; the scorned Land Farm girl; the ganja growing farmer and his mad wife. But over all, there is Flavia. Flavia who shows up the police inspector with her solution to the crimes. Flavia who insinuates herself into everyone's business with her sharp eyes and clever way with science. It is she who manufactures an antidote to cyanide from pigeon droppings. It is she who poisons the chocolates sent to her sister by a lovestruck village boy, and then manages to prevent their being eaten by her entire family, plus the vicar. It is she who worms information out of the village postmistress while sucking on horehound candy, who competently bandages the scalded hand of the tea shop proprietress, who breaks into the library archives using her mouth to break the seal around an old window. 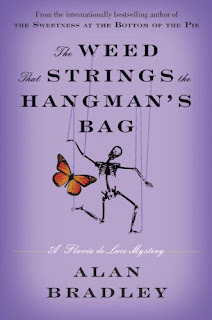 The world is a better place for Flavia de Luce.